One of the most important aspects of Christianity is learning to live for eternity. Dr. Caram seeks to impart to readers the ability to look beyond our natural life and develop a vision to live for the realities and joys of heaven. 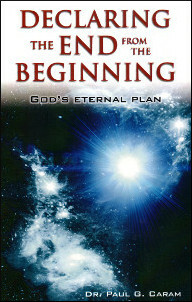 Dr. Caram discusses subjects such as the beginning of the universe, the origins of our spiritual enemies, the purpose God placed man upon the earth, as our eternal destiny to rule with Christ as kings and priests when He comes again.